Finally managed to persuade the little sister that getting up and running at 10am is not “unbelievably early” and that crack of dawn happened a few hours ago and she and her husband put on their running gear and trainers and joined me for a run. The morning was a perfect Autumn one; misty, cold and bright. I decided that day-glo was the way forward and had on my hi-viz yellow top, Nike Capri trousers and neon pink compression socks. Sister came downstairs and said “I’m not running with you! Look at what you’re wearing! What if someone sees us?” The cheek of siblings! SO I retorted “Well, I’m not running with you! What if you stop and walk! What if someone sees us?” Humph. Nothing wrong with being seen especially when you have to run on roads part of the way. And it’s purely by coincidence that I look as though a hi-viz jacket has mated with a jumble sale rail. Got going and we dashed down the main road to St Cuthbert’s Chancel where the footpath starts and across the mud and under the railway bridge, leaping over the largest puddles. Little Sis and her Husband. 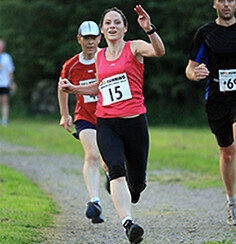 Little Sis demonstrating 'Jazz Hands on the Run'. We ran across a few fields and as the mist hadn’t yet burned off and the grass was all dewy, my trainers quickly become soaked and waterlogged. Not the nicest feeling early on in a run before you’ve even hit the 1 mile mark. Bizarrely I only had one wet foot – the right one. Going across the fields, my footsteps become “Squelch, thud”, “Squelch, thud”, “Squelch, thud.” I sounded like ET with a wooden leg. We went past Pinford Farm and up the footpath leading to the deer park. As we started to climb the hill we saw a deer with giant antlers just a few metres away, however he was obviously vegetarian or at least a pacifist as he didn’t seem to want to eat me or chase me around at all. Ran through the woods and as the path was narrow we spread out a little bit. The little Sis was bringing up the rear and not appreciating this so gave me a heart attack by screaming “Argh! There’s no “I” in team! !” I felt the urge to say, “There’s a ME in team” But thought I might end up getting clobbered so slowed down and kept quiet. We all sprinted down the hill past the shooting lodge. It’s compulsory to run down this hill as fast as you can. I always feel as though I’m going to slide most of the way on my face as my feet get overtaken by my body and can’t keep up but I reach the bottom of the hill just in time. Passed a lady with quite possibly the titchiest dog I’d ever seen. It was very cute but it wanted to chase us and did this by getting under our feet. The owner - instead of calling it back - said “Don’t worry he won’t hurt you.” I wasn’t worried about that – I was worried about hurting the dog. I didn’t want to tread on it and squish it. Woman, call your dog back! I don’t want to be held responsible for the footprint I’ll leave on its head when I trip over it. Two deer had just dashed across the path. The deer with enormous antlers is hiding behind the tree on the right. Little sis is doing really well with her running and I can’t quite believe she’s only been running for about 6 weeks – I’m a very proud older sister. She managed an overall speed of 11 minute/mile which included walking up some of the steepest hills and the route was very much cross country taking in a lot of grassy fields and mown hay to run across. She’s already managed a sub 30 minute 5km and is really enjoying the running club she’s joined. She’s going to start beating me at this running lark unless I do something about it. I can’t have her doing that so I’m either going to have to join a club and attend training or sabotage her in some way. Now where did I put those tacks…?